LONDON, U.K., Mar 09, 2017 (SEND2PRESS NEWSWIRE) — With the constant battle of global tech giants raging, brands such as Apple, Google, Sony and Samsung are forever pushing the limits of consumer tech further than ever before, says tech firm Wondershare. Yet whilst stretching the technological horizon is the ultimate aim of every self-respecting brand, a small Finnish start-up has rocked the mobile industry by announcing the relaunch of the iconic Nokia 3310. Choosing to take a nostalgic look backwards rather than progressively forward, HMD Global has announced plans to relaunch Nokia’s successful 3310 model – a handset first seen 17 years ago. Expected to relaunch this summer at a price of $52 (a mere drop in the ocean compares to the prices of Apple’s iPhone or Samsung’s Galaxy ranges), the Nokia 3310 had a reputation for being near indestructible. While there, participants can learn about Wondershare’s dr.fone software, and download tools to transfer old Android/iPhone data to new Nokia 6, and/or recover deleted photos, videos, contacts, messaging, etc. on Nokia 6. The survey, hosted on the company’s website, has to date received over 2100 votes, with the results currently showing a landslide victory for the “yes” vote at 74%. In addition to the vote, the survey provides an opportunity for participants to comment on their yes or no vote. Wondershare are keen to involve as many participants in the survey as possible. 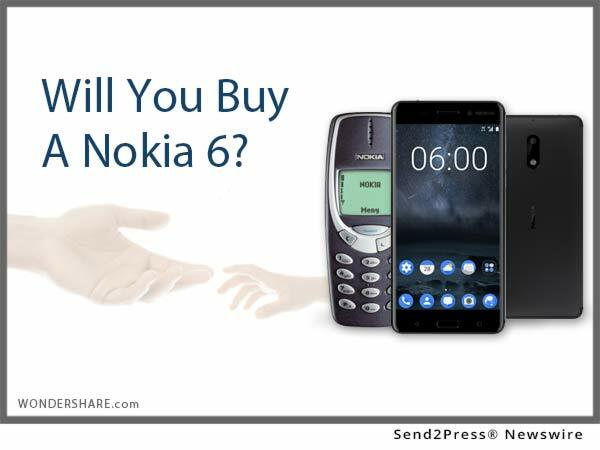 Individuals interested in taking part can visit the Nokia 3310 survey at: https://drfone.wondershare.com/yes-or-no/will-you-buy-nokia-6.html. dr.fone is the world’s first solution providing iOS data recovery software and Android data recovery, which has helped lots of people. With over 10 years of experience in providing people top-ranked software and services, Wondershare dr.fone has been dedicated to serve over 50 million users. Wondersharers have and will never forget the promises and keep helping customers enjoy wonderful digital lives. Learn more: https://drfone.wondershare.com/.